I am not a gushing fan of the tropics. To me, beaches are less that irresistible and tropical sunshine clashes horribly with this forever ivory skin of mine. Still, the tropics have no competition when it comes to fruit. The beauty and succulence of tropical fruit will never grow dull in my mind. 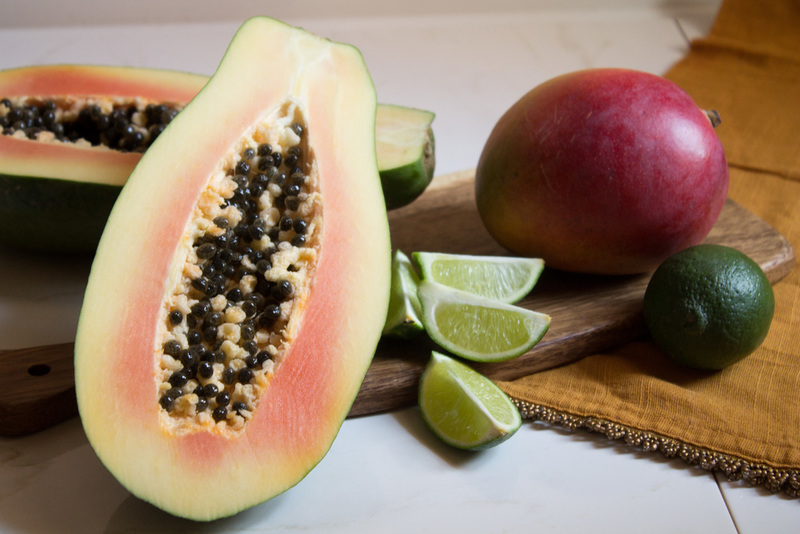 The papaya, perhaps more than any other fruit, expresses true tropical beauty. Just look at that. Her flavor is sweet and floral. She also looks better in a swimsuit than I do and somehow retains her peachy complexion without a trace of sunburn. I saw this salad pictured in my most recent issue of Bon Appetit Magazine. It looked fresh and summery and it gave me an excuse to buy a Papaya. This salad is everything I had hoped it would be. It is refreshing, bright and savory. This salad transports you to a tropical veranda. It is packed full of sweet fruit and fresh mint. This salad is a great "make ahead" dish. The chicken can be grilled and refrigerated until you are ready to assemble the salad, which comes together in a few simple steps. This salad makes my kitchen feel like a tropical paradise, minus the sunburn. Vacation on your plate. In a large bowl whisk to combine soy sauce, sugar, salt and pepper. Toss chicken in the marinade. Cover with plastic and refrigerate for 1 hour. Heat grill to medium high heat and grill the chicken until cooked through but not charred - 5-8 minutes. Allow the chicken to cool and then shred with a fork. In a large bowl whisk to combine garlic paste, lime juice, sugar, vinegar, mint, and olive oil. Toss in chicken, papaya, mango, carrots, and sesame seeds. Serve cold*. Enjoy! *Bon Appetit recommended serving this salad in banana blossom petals, unfortunately I was plum out of banana blossom petals last week so I substituted halves of papaya skin with the flesh removed. It is an excellent alternative, just in case you find yourself with a lack of banana blossom petals.